Priority RV Advantage - In Pontiac Illinois - RV Sales, RV Service, RV Parts, and More. When our customers travel, they will take a network of dealerships with them. 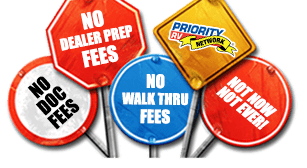 With your Priority Service Card, you will be given priority service at over 100 Dealerships all part of this Priority RV Service program. If you're more than 100 miles away from your home dealership, the closet dealer in this network to your location would be happy to service your recreational vehicle and get you back on the road. Priority RV Road Care offers 24/7 Technical Support and Roadside assistance. Our Concierge services will be your guide, make your dinner reservations and refer you to exciting local activities on adn off the road. This program provides a Gold membership fitting you and your family's needs!